New Orleans, LA... June 8, 2011... Music Rising, a post-Katrina program co-founded by U2's The Edge, legendary producer Bob Ezrin and Gibson CEO Henry Juszkiewicz, with a mission to restore and preserve the musical heritage of the Gulf Coast region, announced a new "Spotlight Artist Series" to debut on the www.musicrising.org site Monday, June 12, 2011. The Music Rising Spotlight series will provide fans and supporters the opportunity to experience musical compilations and current releases by some of the world's greatest artists and emerging singer/songwriters. All music featured will have a special meaning to the Gulf Coast, celebrate the culture and/or be an original submission from one of the many musicians who are from the region or originate from the area. Emmylou Harris kicks off the Music Rising Spotlight Series with her newly released "New Orleans" from her latest album "Hard Bargain." Harris wrote 11 of the songs on "Hard Bargain" and New Orleans tells the tale of her stormy recent memories of the Crescent City. The album is more of an autobiography of the songstress with six decades of wisdom. Fans of Music Rising can listen to the single, "New Orleans" for a limited time on the site. Information on how to purchase the single is also available. Other Music Rising Spotlight series artists to be featured over the summer include legendary folk hero, Arlo Guthrie and numerous other artists to be announced every few weeks. Announcement will be made each month on the site and artist's features will include interviews, up-to-date tour information, album releases and biographies. Other offerings this summer will include a commemorative issue of "Make It Funky," an award winning documentary produced by New Orleans native Michael Murphy which focuses on the history of New Orleans and the rebuilding after hurricanes Katrina and Rita. Other update to the Music Rising site will include new merchandise to benefit the organization. This will include new 2011 Music Rising collectible t-shirts and guitar pick paks. These will be available late summer for purchase with all proceeds going directly to the charitable organization. Other plans include a Winter 2011 "Icons of Music" auction in Los Angeles to benefit Music Rising and several new promotional partnerships which will be announced over the course of the next few months. Music Rising was formed in late 2005 by U2's the Edge, legendary producer Bob Ezrin and Gibson Guitar Chairman and CEO Henry Juszkiewicz. Since its inception it has been recognized throughout the world and has aided thousands of professional musicians, students, choir members and celebratory krewes in the area. The organization is the recipient of numerous awards including the 2006 HALO Award for Cause Marketing, the 2007 Billboard Humanitarian Award and the 2008 PRISM Award. It has been recognized by the Bush-Clinton Katrina Fund and has worked closely with the Clinton Global Initiative. Music Rising's entertainment industry supporters have included MusicCares, Guitar Center Music Foundation, MTV Networks, VH-1, The Kennedy Marshall Company, ABC Television, Hard Rock International, Julien's Auctions, NFL, Real Networks and many others. 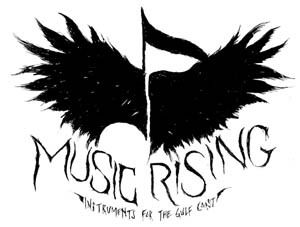 Music Rising is administered by The Gibson Foundation. For more information on Music Rising go to www.musicrising.org.